With so much of its money and profits coming from big Power and mainframe servers, you can bet that IBM is not exactly enthusiastic about the advent of the eight-core "Nehalem-EX" Xeon 7500 processors from Intel and their ability to link up to eight sockets together in a single system image. But IBM can't let other server makers own this space either, so it had to make some tough choices. While RISC, Itanium, and mainframe servers still have plenty of RAS advantages, the scalability advantages are becoming less of a factor, and that means all big Opteron and Xeon servers will put both direct and indirect economic and technical pressure on all IT shops that currently use proprietary midrange and mainframe machines as well as RISC/Itanium servers. But IBM has, at least at first, put Intel's Xeon 7500s and their crimped HPC variants, the Xeon 6500s, to use in a way that minimizes the damage to its high-end server products. Big Blue is using its own eX5 chipset, which no doubt can scale to 16 sockets and maybe more, to relegate the Nehalem-EX processors to two-socket and four-socket servers where customers will pay a premium for fat main memories rather than building bigger boxes from the chips. That gives the new four-socket Power 750 and eight-socket Power 770 and 780 servers announced in early February using IBM's eight-core Power7 chips a chance to sell. It also gives IBM something interesting to sell against two-socket servers based on the new six-core "Westmere-EP" Xeon 5600s from Intel and the twelve-core "Magny-Cours" Opteron 6100s from Advanced Micro Devices from rivals Hewlett-Packard, Dell, and Fujitsu. The Xeon 5600s took the field in the x64 server war two weeks ago and the Opteron 6100s rolled out to face them and the Xeon 7500s earlier this week. BM dropped the Xeon 5600s in its existing BladeCenter blades and System x racks and towers that support the Xeon 5500s, since this is just a processor upgrade. Big Blue has not said squat about its plans for the Opteron 6100s, which have a new socket and a new chipset and are therefore not compatible with IBM's existing Opteron products. IBM lifted the veil on the ex5 chipset a bit during the CeBIT trade show in Germany back in early March, getting the kind of preferential treatment that Intel reserved for server wannabe Cisco Systems ahead of the Nehalem-EP Xeon 5500 launch a year ago. The server racket is a bit like the third grade, with everyone wanting to be the teacher's pet, but only Steve Jobs can give teacher an Apple. This week, IBM rolled out the specs of the three initial machines making use of the eX5 chipset and Intel's Xeon 6500 and 7500 processors. We now know that these machines, which didn't have names a month ago, are the BladeCenter HX5 blade server and the System x3850 X5 and x3950 X5 rack servers. The BladeCenter HX5 is just like IBM's other blade servers in terms of its form factor. 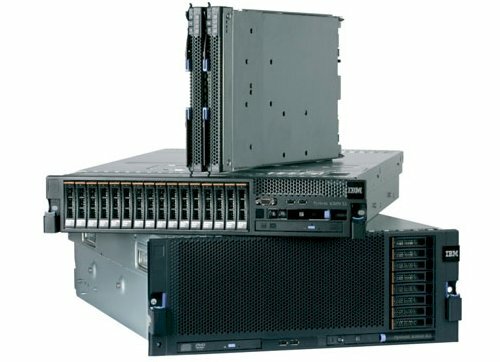 All of IBM's blade servers have been the same full 7U height since it shipped its original blades back in 2002, and the basic chassis still holds 14 single-wide (30mm) blades. The HX5 is a two-socket, single-width blade server and taking a trick out of the playbook that IBM created originally for its Opteron-based LS22 and LS42 blades, you can snap two HX5 blade servers back-to-back and turn them into a four-socket blade. You can't do this with the Xeon 5600s or earlier Opterons in the 2000 series, and you won't be able to do this with the future Opteron 4100s either. But the Xeon 6500 and 7500 chips and the Opteron 8000 and 6100 series have built-in electronics that allows for this SMP expansion. This is now called a FlexNode upgrade. The HX5 blade cannot support the top-end eight-core Xeon 7500 parts, which have a 130 watt thermal design point, but it has been certified to support the eight-core L7555, which runs at 1.86 GHz, has 24 MB of L3 cache, and is rated at 95 watts. For the same 95 watts, IBM also says customers can use the four-core E7520, which runs at 1.86 GHz as well, has 18 MB of cache, and is considerably less expensive. If you can handle 105 watts per socket for your HX5 blade, then you can have the four-core E6510 running at 1.73 GHz with 12 MB of cache; the six-core E7530, running at 1.86 GHz with 12 MB of cache; or the six-core E7540, running at 2 GHz with 18 MB of cache.